XML Prague 2010 takes place in the Lesser Town Campus of Charles University, Malostranské náměstí 25, Prague, Czech Republic. The conference venue can be conveniently reached by the public transport, either by Metro (subway, underground train) line A (green line), to the station of Malostranská and then by a short walk, or by the tramway lines No. 12, 20 or 22 to the stop of Malostranské náměstí. The tramway stop is situated right across the square to the conference venue. For maps, see Google Maps (note that the street view is available in Prague) or Mapy.cz. Public traffic schemes can be downloaded here. If looking for other lodging options check out special discounts and rates for participants on conferences in Prague by Mary´s Travel & Tourist services. See also their Prague Guide. The 119 bus runs from the airport to metro. Tickets are obtained by the yellow kiosks by the bus stops though you will need czech crown coins. The ticket you want costs 26 czk (good for 75 min ride with unlimited transfers). This is the cheapest method of getting into Prague. To get to the city you can also use taxi or contracted transport. As with any big city prices vary directly with the distance from the more popular tourist areas, like Prague old town and anywhere near Charles Bridge. Even though on average the Czech Republic is considered cheap, that doesnt mean you should pay high prices, which falsely inflate prices for those living here. Typically, (and not unusual in Czech) beer is a good indicator if you are getting a fair deal or not at a restuarant or pub, with prices being around 20-25 czk crowns a pint outside of Prague central, do not be surprised if you will be asked to pay double that nearer to tourist areas...though any higher and you know that price gouging is in affect. 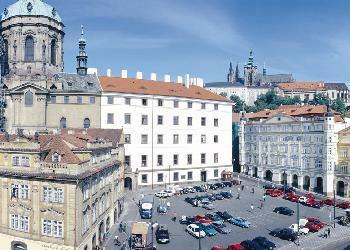 Public transport in Prague is generally very reliable and convenient way to commute or travel around. The network consists of buses, tramways and Metro (subway). Pasengers buy tickets in advance in yellow kiosks or at some news-stands or hotel receptions. Tickets should be stamped as soon as you board the bus or tram, or at the entrance to the metro. You will see yellow stamping machines in all modes of transport. The blank strip at the end of the ticket should be punched; the green light on the machine should come on if this has been done correctly. Check Prague public transport company portal for fares (generally 26 CZK /~ 1 EUR/ ticket is good for any one-way journey and allows unlimited transfers), and journey planner. Prague TV has a video guide to the Prague transport system (note, the prices they say are outdated). Taxi drivers do not have a good reputation in Prague, and, unfortunatelly, rightly so. We would suggest planning all transport in advance, including arming yourself with reputable taxi firms phone numbers if planning a night out... as it is almost certain you will charged the wrong rate if you intend to 'hail' a taxi. Here is a good site which lists reputable Taxi firms.